40 College St Toronto Ont. The Keep Your Community Safe app focuses on building safer communities by leveraging bluetooth technology that allows citizens to locate stolen high-value assets or missing persons and pets through their network. “Their app will now offer citizens the opportunity to report anonymous information directly to Crime Stoppers within their mobile app,” said Sean Sportum, the chair of the Toronto Crime Stoppers Board at the launch to International Crime Stoppers Month at police headquarters on January 3. With support from Cellflare, Toronto Crime Stoppers also unveiled its new 222tips.com website at the conference. Last year, Toronto Crime Stoppers launched several initiatives, including an awareness campaign to bring attention to human trafficking. “This initiative, developed in partnership with DDB Canada and the Toronto Police Human Trafficking Enforcement Team, was extremely successful and has been shared across Canada,” said Sportum. “It received the Special Project Award from the Ontario Association of Crime Stoppers and the Advertising & Design Club of Canada gold award. Tips have resulted in the seizure of guns and other weapons as well as large quantities of illicit drugs, including opioids. Crime Stoppers Toronto received 9,349 tips in 2018. The tips received last year led to 76 arrests, 234 charges and $137,225 in property seized. A total of $231,359 in drugs were also seized last year. Since its inception 35 years ago, Toronto Police has received 156,218 tips resulting in 37,953 charges, $64,766,661 in property confiscated and $314,234,811 in drugs seized. Det. 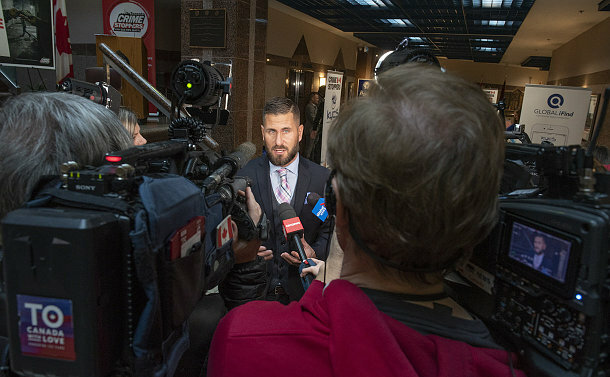 Dimitrios Tsianos, the Crime Stoppers Toronto Coordinator, said the program has helped change the face of criminal activity in Toronto while helping build a safer city by partnering with community leaders, media and the Toronto Police Service. The theme for Crime Stoppers in 2019 is ‘Say It Here”. Dave Forrester, the president of Canadian Crime Stoppers, said the 87 programs received over 500,000 contacts from the public and over 200,000 of them were actionable tip that were assigned to law enforcement partners.